Doing research is one of the most amazing things about being a writer. It takes you to places you never thought you'd go, and you find out some pretty fantastic facts. Although I got the idea for my latest book, K9 Heroes, while I was on a writing retreat in USA, I actually wrote it back home in Australia. And thanks to the internet, my research took me all around the world, without having to leave my study. Researching for K9 Heroes also reminded me how important it is to check and recheck everything ... especially if your sources come from the internet. K9 Heroes - Stories of Real Rescues is an anthology of four stories inspired by true tales of dogs who have saved people's lives. Dogs are pretty awesome, and in my book I wanted to show just how amazing they are. While at my writing retreat, I learned about Angel, the golden retriever in Canada who saved his owner from a cougar attack. Then I discovered the story of the homeless boy in France who got his life back on track thanks to his amazing dog. I found a story from America about a Blue Heeler pup called Anna who saved her owner, Candace from her burning mobile home. I needed one more story, and I wanted it to be from Australia. My own dog, Puff, a Kelpie/Koolie had rescued 2 kittens from the bush near our home, so I already knew just how fabulous Aussie dogs are. It didn't take me long to find the perfect story, Jimpa's Journey, discovered on the Guinness World Records site. The farthest distance that a lost pet dog has found his way home occurred in 1979 when Jimpa, a labrador/boxer cross, turned up at his old home in Pimpinio, Victoria, Australia after walking 3,218 km (2,000 miles) across Australia. His owner, Warren Dumesney (Australia), had taken the dog with him 14 months earlier when he went to work on a farm at Nyabing, Western Australia. During his trek the dog negotiated the almost waterless Nullarbor Plain. Sounds like the perfect story doesn't it? Maybe even too amazing to be true? I found newspaper articles verifying Jimpa's story, including one in the Canberra Times about Jimpa's amazing feat. But it seemed almost impossible to find a picture of this K9 Hero. Strange! And I'd never heard of Pimpinio before so I wondered why the town had not been made famous by this heroic pooch. I started planning my trip there to see what I could discover. In the meantime, I contacted the local historical society to see if they could tell me anything. Within a week, the news came back, both good and bad. "Yes, Jimpa's Journey had been reported in the papers." But, "No, it wasn't true." Shortly after the story appeared in the Horsham Mail-Times, a woman came forward with proof that Jimpa was actually her dog, Ben, who had disappeared from her backyard a few days earlier. Sad news for Jimpa's owner, but a happy reunion for pensioner, Mrs Durand. I found another Aussie tale, along with irrefutable evidence that it was true. But what a relief to have taken my Jimpa research that extra step, to discover that the story wasn't true before it went to publication. Research is fun, and exciting, but it's so important to get it right. Here are my tips to help you on your research journey. 1. Check and recheck the facts ... and your sources at least three times ... preferably more. 2. Go beyond the surface, and be persistent. You might need to go to a number of books or sites to find the most interesting pieces of information. 3. Follow your instincts. If for some reason, you feel something doesn't sound right, it probably isn't. Keep digging till you get to the truth. 4. Don't get lost in your research. It's easy to get so involved in your research that you run out of time to write the actual story. Decide on keywords and search terms to use and try to stick with them. Work out exactly what you need to find out before you start researching. 5. Keep a file with interesting research that you don't use in your story. It might come in handy for another piece of writing. BIO: Dee White is the author of 18 books for children and young adults. She was recently awarded a grant to spend a month in Paris researching her work in progress, Beyond Belief, inspired by the true story of Muslims at a Paris Mosque who saved Jewish children during WW2. 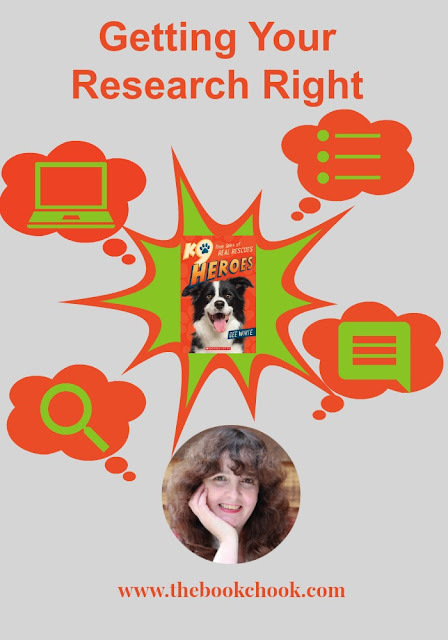 Dee’s most recently published book is K9 Heroes True Tales of Real Rescues, published by Omnibus Books. Book Chook Note: This helpful article for students will be added to my list of ideas for Encouraging Children to Read, Write and Create, and my Pinterest Board, Helping Kids to Write. Read my review of K9 Heroes here.